Introducing the Nemesis One ROM! The best ROM EVER built for Titanium S5. With superb themes, revamped UI, a brand new Launcher, Android 4.2 status bar and the fastest kernel out there, it’s merely what you ever wanted. THE ANDROID 4.2: With Nemesis One, get the originality of Android 4.2 Jelly Bean on your phone. See your Little Young transform into Google Nexus. It has the unique Nemesis Launcher-a complete replica of the Jelly Bean Launcher, the JB Framework, the JB Settings, Task Manager, File Explorer and the Android 4.2 Status Bar, JB Apollo Music and lots more-get the taste of Jelly Bean in everything with Nemesis. So, Samsung, you won’t give us an update? It looks like we don’t even need it now! THE BUTTERY-SMOOTH, ROCK-SOLID AND ION-STABLE UI: With Nemesis, get your phone work on the smoothest framework ever. You get no lag, no FC, no Error. Young will be young and run flawlessly. The silky smooth transitions and animation of apps-This indeed is something which will charm you! Nemesis features a unique all-in-one Audio Booster-Get the ALSA, BEATS EQUALIZER, DOLBY DIGITAL 3D SURROUND SOUND, DSP MANAGER, SONY xLOUND Audio Enhancement and lots other sound boost tweaks. Apollo Music Player-the best music player as of now is included. So turn your little young into an iPod. Play your music like never before. Enjoy the most magnificent music with your family and friends, with Nemesis One. Nemesis One features loads of tweaks to get the best out of your phone. There is as many as 50 build.prop and 15 init.d tweaks. Get the most renowned built-in Kernel tweaks with Nemesis Fusion. You get the most significant tweaks like Adrenaline-Engine, Sony Cybershot Mod, complete Kuro Tweaks, Built-in Adblockers, etc. etc. So, get ready, to, gear up, pace up, enjoy- the best ROM ever made, on your Karbonn Titanium S5. Kernel Information: The Rom Contains Stock Kernel. 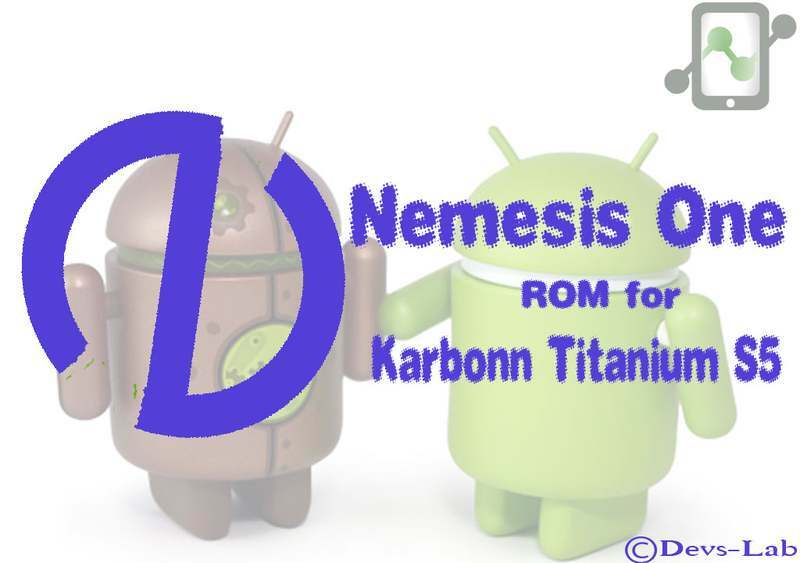 Disclaimer : We have not developed this Nemesis One Custom ROM for Karbonn Titanium S5, so we are not responsible for any of the problems that you face after installing it. Make sure, you follow this post at your own risk on. Step 1: Once you download the above files, place it into external SD card. Step 2: Switch off your device and enter into Recovery Mode to do so: Press and hold “Volume Up + Home + Power button” for a few seconds, until the screen flashes and then release all the buttons. Select “wipe data/factory reset“, then select “Yes” for confirmation and wait till the data wipe is complete. Now, go to CWM recovery main menu. Select “wipe cache partition” and after that, select “Wipe Dalvik Cache” under advance option to perform Dalvik cache wiping. Step 4: Again come to the CWM recovery main menu from there select “Install zip from sdcard” and give a path where you have placed Nemesis One Custom ROM for Karbonn Titanium S5. As you select the installation will start and it will take 3-5 minutes to complete so don’t hesitate let the installation to be completed. Step 5: Finally, when the installation process is completed. Select “Go Back” and then choose “reboot system” to reboot your phone. The phone will take 10-15 minutes to start and initialize all the services & apps, because this is the first time you are starting your device after installing the ROM.